She said the location of the event held a "sentimental" meaning to her family. The event's location, the steps of the Yavapai County Courthouse, holds a "sentimental" meaning to her and her family, as it's where her late husband, Sen. John McCain, started and ended a number of his campaigns. "Obviously, it's a little difficult for me to be here tonight, but this isn't about me," she said. "The one thing I would pray for, and wish I would have had, is my husband with me tonight, because it was such a tradition for our family, and I think for the state of Arizona, so I'm so grateful that. Doug Ducey has decided to keep the tradition going." She acknowledged how not all of her husband's appearances on these storied steps, where Barry Goldwater announced his presidential bid in 1964, were positive -- it's also where John McCain concluded his 2008 presidential bid. "For any of you here tonight, and those of us on the stage, win or lose, we need to figure out how we can come together, work with our allies and our rivals and help make this wonderful country better than we found it," Cindy McCain said. (Meghan Keneally/ABC News) Cindy McCain speaks at an Election Eve rally held by the Arizona GOP on Nov. 5, 2018. She added, describing her late husband: "He felt responsible for helping find solutions to America's problems, and ready to work with anyone to get it done." There were a host of Arizona Republicans at the event, including Gov. Doug Ducey, who is running for re-election, Sen. Jon Kyl, who temporarily assumed McCain's seat, and Rep. Martha McSally, who's running to fill Sen. Jeff Flake's open seat. Cindy McCain praised Ducey and Kyl but didn't directly address McSally. Cindy McCain also has not publicly endorsed McSally. 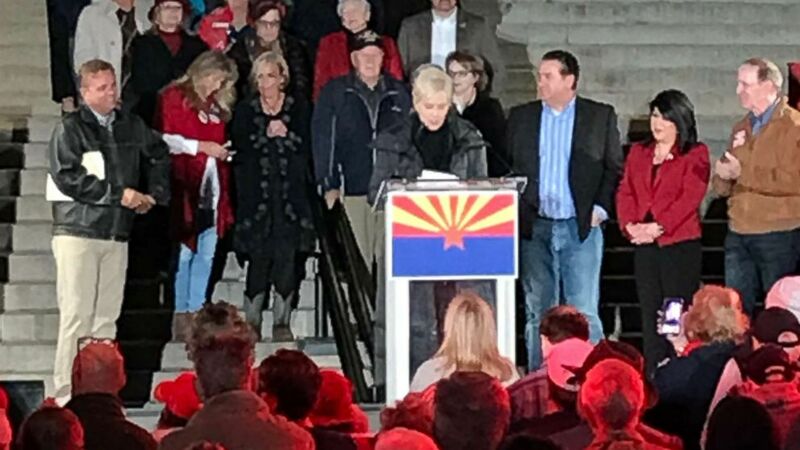 Cindy McCain thanked Ducey for hosting the event and praised Kyl, whom she introduced to the crowd. "My real job is to introduce this next speaker, and what a wonderful man, and I can think of nobody any better, to not fill my husband's shoes but to borrow them for a little bit, than Senator Jon Kyl," she said. 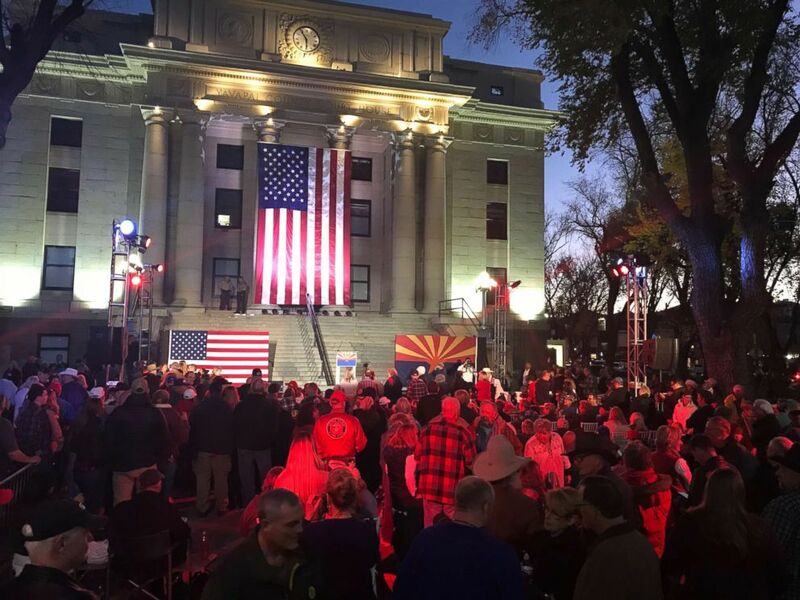 (Meghan Keneally/ABC News) The Arizona Republican Party held an Election Eve rally on the steps of the Yavapai County Courthouse in Prescott, Arizona, on Nov. 5, 2018. McSally spoke after Kyl, and said she was honored to "follow in the footsteps" of Goldwater, McCain and Kyl, ending her campaign on those courthouse steps. "I just want to share, I have a heart of humility right now and a heart of gratitude -- humility that I am in a position to be walking in the footsteps of giants, giants who launched their campaigns here and finished their campaigns here," McSally said. "I mean it's just extraordinary." She then called on the hearty crowd to make sure to vote if they hadn't already, stressing the importance of the individual, working in a few military terms along the way. "I won my first election, well the one that I won, by 167 votes. So my new call sign is landslide, OK?" she said. "So I know better than anybody ... how every single vote really really matters."